The global cosmetic market is expected to grow at a rate of 6.4% per year, and it is estimated to reach $675 billion by 2020. According to a recent survey, the average woman spends $300,000 on beauty products in her life; however, the popularity of the makeup trend will continue to be fueled, in part, by a growing number of men investing more on their appearance. In an age where beauty enthusiasts can shop simply by scrolling through images, product development departments are finding new ways to catch the consumer’s eye in the crowded social media marketplace. Beauty brands are changing their packaging, innovating the way their products are applied, and introducing new textures and broader ranges of color, all to connect with the customer through a thumbnail image on Instagram. Palettes are key when it comes to bringing out the unique personality of beauty and skin care brands. Clinique’s colorful and fresh “endless springtime” vibe and the earth-toned Urban Decay’s “walk on the wild side” attitude are only two examples of how beauty companies are effectively building a memorable identity. A beauty enthusiast could scroll through her Instagram feed and immediately recognize a brand among hundreds of others, so how are beauty brands able to engage with consumers in a unique, successful way? 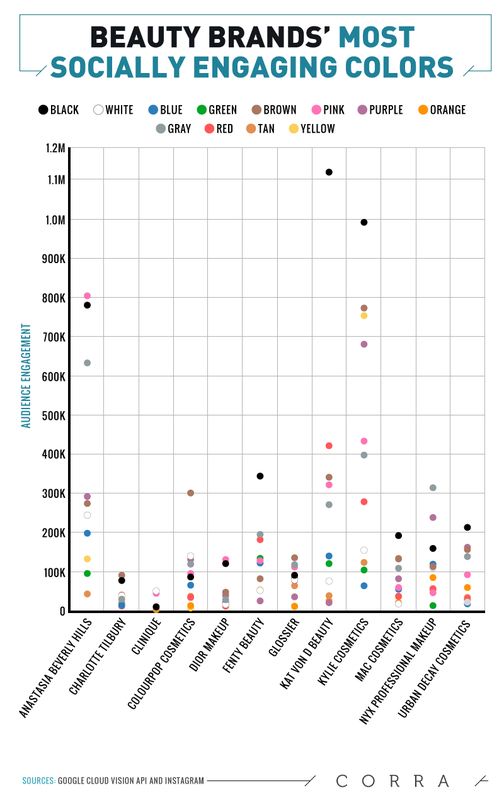 In this study, we analyzed how product branding is affecting the social performance of 12 of the most popular cosmetic players. 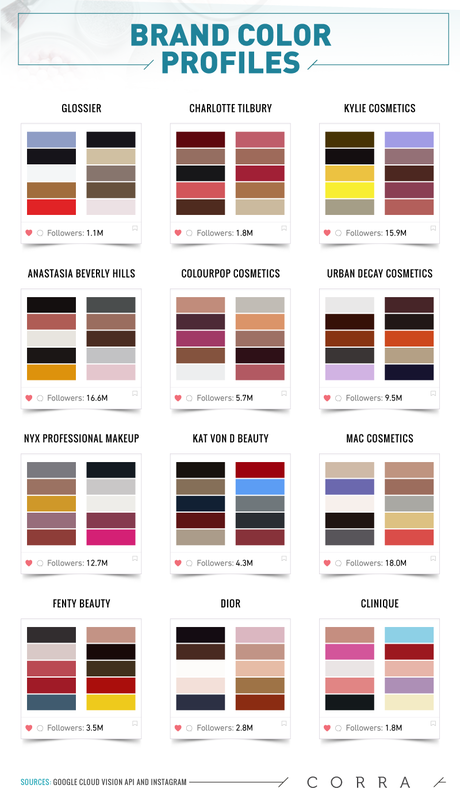 Of the 12 cosmetics brands analyzed, we chose to represent each with a unique color profile, defined by the color palette of their social media canvas. With a 18 million follower count, MAC Cosmetics continues to lead the social scene through a broad range of skin-tone neutrals punctuated by vibrants such as deep royal purple and a glamorous red. MAC’s Instagram feed not only showcases bold colors and a variety of metallic shades, but uses a diverse range of models and celebrities to celebrate human uniqueness. Kat Von D – known for color-rich product lines with an edgy, vampy twist – dove much deeper into black and red. On the other hand, Dior’s palette was a classic one, opting for soft pinks, medium nudes, and a touch of classic black, as is expected from a long-standing, high-end brand. According to our social media deep dive, racking up followers does not necessarily translate to higher levels of post engagement. Contrary to popular belief, engagement is actually the secret sauce behind social media success: having a large following is only half the battle. 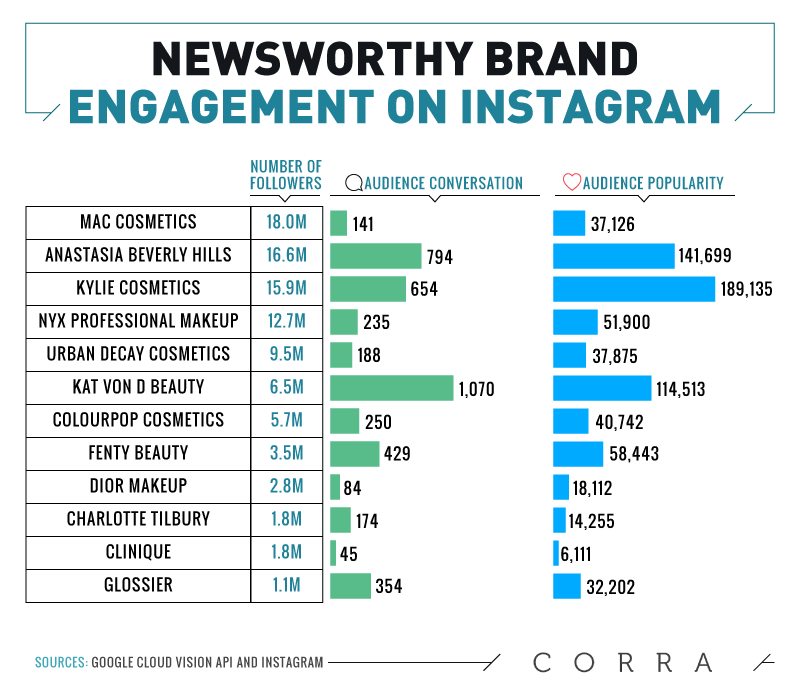 Case in point: MAC Cosmetics boasts a whopping 18 million Instagram followers, but their average post engagement is fairly modest at 141 comments and just over 37,000 likes per post. In comparison, Kylie Cosmetics receives more than 650 comments and just under 190,000 likes on any given Instagram photo – light-years ahead of MAC with 2.1 million fewer fans. To be fair, Kylie Jenner may be in a league of her own: Currently sitting roughly 107 million Instagram followers herself, she has managed to build a hyper-loyal fan base that supports both her as an influencer and her cult beauty brand. Appealing to a largely millennial audience, and as a social media personality herself, it comes as no surprise that Jenner’s disciples show up in droves to shower her cosmetics brand’s Instagram page with love. The most notable trend breaker is Kat Von D Beauty’s numbers: With a more humble 6.5 million followers, this page racks up the highest number of post comments on average, at 1,070, and the third-highest number of likes per post. Regardless of each brand’s typical color palette, black proved to be a very socially engaging color for a number of cosmetics giants. It swept the two highest slots at over 1.1 million interactions and just under 1 million interactions, respectively, as seen on the Kat Von D Beauty and Kylie Cosmetics Instagram pages. Pink was the third most engaging color, driving an average of 800,000 likes and comments to the Anastasia Beverly Hills Instagram page. The top-performing colors bottomed out at around 650,000, after which there was a fairly significant drop, tightening the range for the remaining colors quite a bit. The majority of posts gleaned between a handful and 450,000 average comments and likes. The research surrounding the psychology of color makes it challenging to determine the effects of specific colors for branding and marketing purposes. However, savvy brands know how to curate their palette according to their target market to engage, inspire, and build loyalty. There is no shortage of eye-catching content categories with a history of grabbing Instagrammers’ attention and mobilizing their thumbs. In the world of cosmetics; however, there were a couple of clear winners that rose above the noise. In case you needed any more proof that celebrity product endorsements really work, this type of Instagram post amassed the overall highest volume of likes and comments, at 44,244 on average. 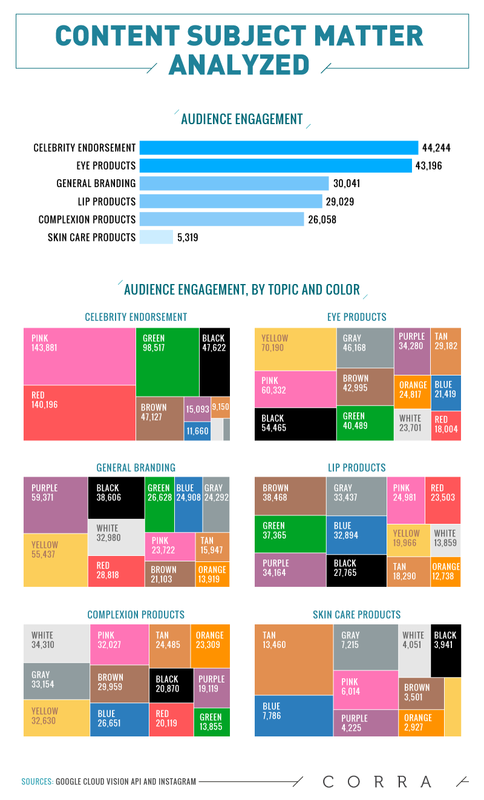 Eye product posts were hot on their tail, at 43,196 engagements on average, followed distantly by general branding. Interestingly enough, there was no overlap when it came to the most engaging color for each of our chosen subcategories. Celebrity endorsement was ruled by pink and red, yellow-hued posts drove more engagement to posts showcasing eye products,, and general branding shots seem to resonate more when they included purple hues. 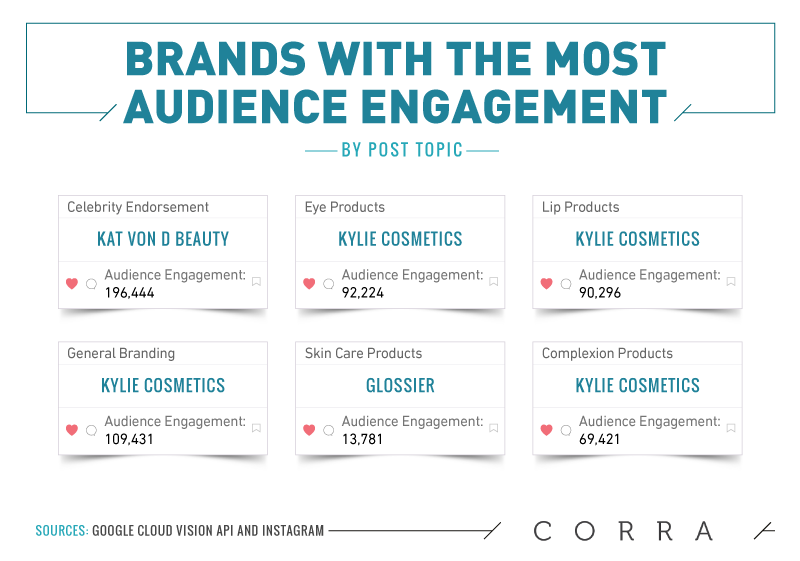 Kat Von D Beauty’s has the most engaging Instagram content in the category of celebrity endorsement, immediately followed by Kylie Cosmetics. When the creators of the makeup line are world-known celebrities – not to mention brand ambassadors of their own products – engagement rates reflect their growing popularity. While Glossier has seen impressive branding success in the millennial market, Kylie Jenner is still one of the most influential figures in the social media sphere. Instagram pages like Kat Von D Beauty and Kylie Cosmetics have unequivocally proven you don’t need to amass an enormous amount of followers to edge out the competition. Brands with an active community of loyal followers can benefit from twice the engagement rates compared to brands with larger follower counts. Factors such as color palette, celebrity involvement, and content subject matter can contribute heavily to the overall performance of an Instagram product page; however, a brand is most likely to drive engagement when its unique personality remains consistent across all channels. Part of the seamless brand experience involves making sure your site is as engaging as your social strategy. Visit us at Corra.com for inspiration and, better yet, to create your brand’s new home. We selected 12 newsworthy beauty brands to analyze and then scraped their Instagram profiles to collect the 50 most recent posts. We then ran the images through the Google Cloud Vision API to collect colors most dominantly used in each account. We analyzed comments, likes, colors, and the frequency of colors used by each account. We used an average of comments and likes to determine audience engagement. We analyzed the text and tags of each post to determine subject matter to see which colors were the most engaging to viewers and to see which posts correlated with the most engagement. Interested in sharing our study about engagement on Instagram? Crediting is required to use these images and content for noncommercial purposes. In order to give the authors proper credit, please embed a link to this page.